Network Health offers several Medicare Advantage Plans that include comprehensive medical and drug coverage. The following plans include built-in pharmacy coverage. You can only be enrolled in one Part D prescription drug plan at a time. If you are enrolled in a Medicare Advantage Part D plan, you must receive the Part D coverage through that plan. If you do not add prescription drug coverage when you are first eligible (and you do not have coverage that’s as good as or better than Medicare Part D coverage) and you choose to add it later, you will have to pay a penalty. If you enroll in a Stand-Alone Prescription Drug Plan, you will automatically be disenrolled from the Medicare Advantage (PPO) or (HMO) plan and returned to Original Medicare. If you have Veterans Affairs (VA) benefits, you may be eligible for prescription drug coverage through the VA. If you take several medications, we have a program to help you manage your medications and make them work the best for you. Network Health has partnered with OneTouch® and Accu-Chek® to bring diabetic monitoring meters to our members at no cost. As a Network Health Medicare member, you can get a long-term supply (up to 90 days) of drugs shipped to your home using our plan’s network mail order delivery program. Usually, you will receive your mail order prescriptions within 14 calendar days. If your order does not arrive within the estimated timeframe, call Express Scripts Customer Service at 800-316-3107 (TTY 800-899-2114), 24 hours a day, seven days a week. This Extra Help table shows what your premium will be if you get extra help from Medicare to pay for your prescription drug costs. Network Health uses procedures and software to ensure the most cost-effective and safe medication therapy is shared with our members. This document explains the new policies put in place by the Centers for Medicare and Medicaid Services (CMS) to help members use opioid medications more safely. We may add or remove drugs from our formulary during the year. If we remove drugs, add prior authorization, quantity limits and/or step therapy restrictions on a drug or move a drug to a higher cost-sharing tier, we must notify members who take the drug of the change at least 60 days before the change becomes effective (or when a member requests a refill). You may ask Network Health Medicare Advantage Plans to make an exception to our prescription drug restrictions. To do so, you should submit a statement from your physician supporting your request. You can call us to ask for an exception, submit your request by using the link below or fax or mail the form found at the link below. An in-network pharmacy is a pharmacy we have an agreement with to provide prescription drug coverage. To have your prescription drugs covered, you must use an in-network pharmacy. You may change your pharmacy at any time, as long as it's in our network. For help finding an in-network pharmacy, call the customer service number on the back of your Network Health ID card or use the simple tool above. The pharmacy network may change at any time, and not all in-network pharmacies may be listed. You will receive notice of changes when necessary. An in-network pharmacy where drugs are covered at a lower cost. What's a standard or non-preferred pharmacy? An in-network pharmacy where drugs are covered, but at a higher cost. When can I use an out-of-network pharmacy? Under limited circumstances, we will fill prescriptions at out-of-network pharmacies. However, these occurrences should be rare. Our network of pharmacies extends nationally, so you can continue to get prescriptions filled outside of our service area. The types of pharmacies included in our network include retail, mail order, long-term care, Indian Health Service/Tribal/Urban Indian Health Program and home infusion pharmacies. How can I request a printed pharmacy directory? Sign up for convenient home delivery of your prescriptions with this mail order form. Or call 800-316-3107, 24 hours a day, seven days a week. If you purchased prescription drugs without presenting your ID card (due to an emergency or at non-participating pharmacy of medical facility), complete our prescription drug claim form for consideration of reimbursement from Express Scripts. Members have the right to ask us to reconsider a coverage decision made for a particular prescription drug. Members have the right to request a coverage determination from your plan if you disagree with information provided by the pharmacy. Our transition plan policy defines how Network Health provides a transition fill process for Medicare Part D beneficiaries. This is a Federal policy designed to ensure the Medicare Advantage plan has established appropriate cost-sharing for low-income beneficiaries. A drug tier is the cost category a drug belongs to. It determines what you pay for the drug, and usually the higher the tier the more you pay. Within each tier, you pay less when you use a preferred pharmacy. You can look up medications to find out what tier they are on in our Look Up Medications search. A copayment is the set fee you pay for a prescription drug. Copayments vary based on the drug tier and whether you are in initial coverage, the coverage gap or the catastrophic coverage period. You pay less when you use a preferred pharmacy. What's the difference between brand name and generic drugs? A brand name drug is a drug that is protected by a patent. The drug can only be made or sold by the company that holds the patent. A generic drug is approved by the U.S. Food and Drug Administration (FDA) as having the same active ingredients as a brand name drug, but generally, the generic drug will cost less. Is a generic drug as good as a brand name drug? Yes, generic drugs are just as good as the brand name because they are approved by the FDA as meeting the same standards. How does the coverage gap work? Medicare Part D, or prescription drug coverage, has four different periods of coverage. The example below uses a $20 generic drug and a $100 brand name drug to show what you'd pay. 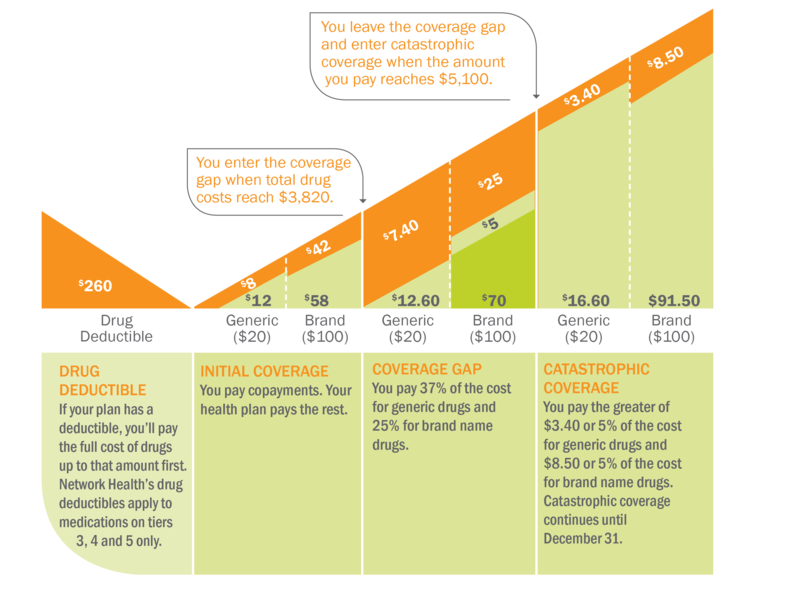 How do I know when I've reached the coverage gap? You will receive a monthly statement from ExpressScripts. This statement will show how much you've paid for your drugs and if you are in the coverage gap. If you have any questions, you can always call 800-378-5234 (TTY 800-947-3529) to speak with a health care concierge.